(Source: MiBAC) The Soprintendenza Archeologia, Belle Arti e Paesaggio della Basilicata in collaboration with its Venosa office, will hold guided tours of the Jewish Catacombs at Venosa on May 20 & 21, 2017, in conjunction with the annual European Museum Night. These catacombs were in use for burial between the fourth and seventh centuries CE, and have been restored recently in hopes of being able to open an entire new sector of the site, close to where a decorated arcosolium tomb was seen in the early 1970's. 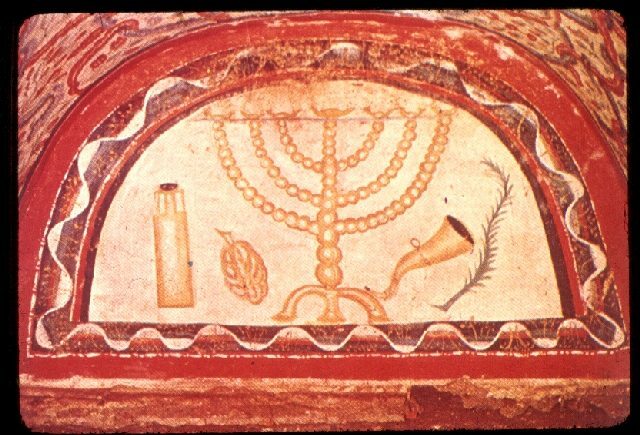 On display are inscriptions in Greek, Latin, and Hebrew, as well as examples of wall paintings, several decorated with Jewish motifs. The Jewish catacomb is now accessible by means of wooden walkways over the original floors, and has some permanent lighting as well as a panel display at the entrance that maps out and discusses the site's history and architecture. A flashlight still is recommended. The visiting times are: May 20, from 3 p.m. - 7 p.m. and May 21, from 10 a.m. - 1 p.m. and 3 p.m. - 7 p.m. Reserve spots at: +39 0972 36095 - 339 4004298 or emailing Antonio Rosa at: antonio.rosa@beniculturali.it . The catacomb is located on the via Ofantina, outside of the city center. The ticket price for the visit is € 2,50, which includes admission as well to Venosa's Archaeological Museum and the site of the "Incompiuta", where Jewish epitaphs of a later period are found. Event information in Italian at: http://www.beniculturali.it/mibac/export/MiBAC/sito-MiBAC/Contenuti/MibacUnif/Eventi/visualizza_asset.html_1545722501.html.